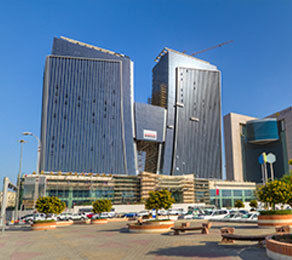 The £101.9 m Al Shemouk Twin Towers project in Doha, Qatar, is a commercial and retail development spanning a pair of 22-storey towers and central mezzanine level, with a combined area totalling 170,000 m2. Amenities provided at the Twin Towers include conference and meeting rooms, restaurants, a swimming pool and a health club. CCL designed, supplied and installed its post-tensioned (PT) XF flat-slab system, which covered a total area of 45,000 m2 and used 216 tonnes of strand. The objective of the company’s involvement with the project was to provide value engineering on the original PT design provided by the main consultant. CCL’s design team proposed installing band beams for the long spans and then cantilevers of 4.0m to 5.0m to enhance deflection. The company provided its cost-effective solutions on the site from July 2011 to July 2012 and completed the project within the predicted timescale.